All transactions are safe and secure with a reliable history in online purchasing behind each of our associates. 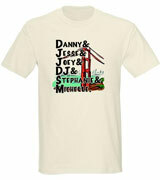 Buy the Tanner Family Full House t-shirt to own Full House clothing and merchandise. Although Danny, Jesse, Joey, DJ, Stephanie and Michelle aren't all Tanners, they are all an important piece of the Tanner family. If watching this San Francisco family drive across the Golden Gate Bridge brings back fond memories of your childhood, then these Full House shirts will too. This names design is perfect for anyone who can't decide which character is their favorite because they are all special in their own ways. In addition to the Tanner Family Full House tee above, browse the Full House Clothing Gallery for more apparel like men's and women's clothes, kids shirts or hoodies.